As the number of SaaS applications has exploded, the SaaS ecosystem is responding to data fragmentation with middleware. This isn’t the middleware of the early 2000s, which was focused on helping developers build software. This is middleware that is focused on helping end-users unify data from the vast numbers of data repositories now existent. Ten years ago, sales teams captured basic data on customers and prospects. Names, addresses, budget, time frame. All of it collected over the phone. Today, sophisticated operations teams manage lead lists numbering in the millions, enrich those lists with data providers, and integrate marketing, product, and external data to amalgamate a rich profile of prospects. All in effort to maximize sales efficiency and reduce sale cycles. Before you contact a potential lead, you can know what infrastructure they run, when the contract of a competing product expires, how may times they visited your website, which creative they respond to, which social media channels they are active on and so on. Pretty soon, you’ll have their social security number via API and know the brand of their underwear. As a movement forms around customer operations, integrating this data across the 20 or 40 tools that a go to market organization might use is critical. Mapping data from customer success experience back to marketing campaigns improves advertising performance. But, it would be a mistake to say that this type of data fragmentation exists only for the go-to-market organization of the company. Finance teams are increasingly using more software, everything from purchase order management to sales forecasting to financial planning and analysis to accounts payable optimization. Product teams synthesize data from product usage, content marketing, engineering, infrastructure. Same for security. And HR/recruiting. Analysts forecasting the future and data scientists building data productS. And so on. In the past, the success of point solutions have triggered M&A waves. The incumbents acquire successful point solutions and combine them with an existing platform, to capture more revenue and reinforce their competitive advantage. But in this era, consolidation isn’t happening as quickly as operators would like. How can it? We’ve seen a more than 7X explosion the number of tools being sold to sales and marketing teams in the last 3-4 years. The market demand exists for data centralization tools. Databases that unify information across domains, at opposite ends of the corporate spectrum. Combine marketing data with infrastructure performance to understand how website rendering speed influences conversion rates for an e-commerce merchant. And there will be several very large companies built serving the needs of these buyers. These are the new systems of record: the systems that amalgamate information from all other systems to provide a single view for a team or department. They become the new systems of record because upon that data, teams can act, and they will likely respond to changes within trends using code. 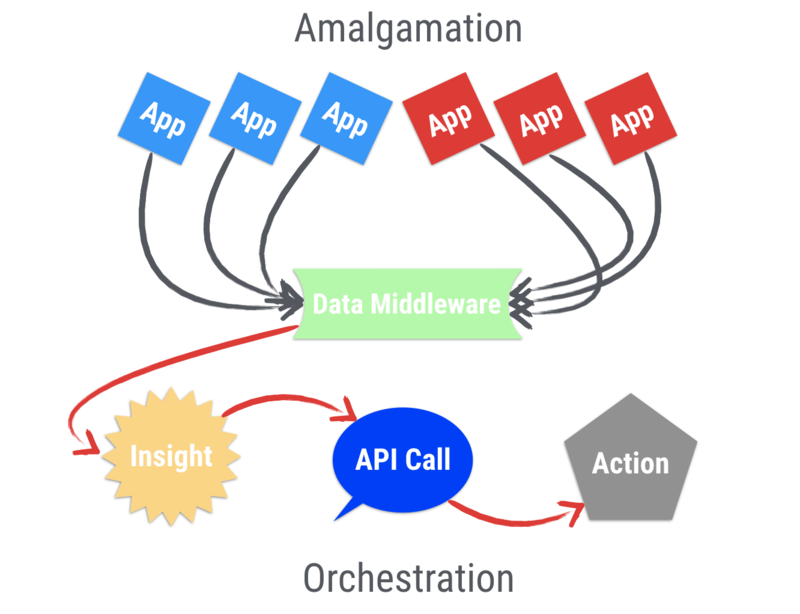 Insight -> API call -> Action. Machine learning is a key component of generating those insights. Data volumes exceed any human’s ability to process it, so machines will be responsible for finding anomalies or conditions that require human intervention. Server slowdown impacting Californian customers? Page an ops person, pull the recent log information and tee up the diagnostic workflow. A sales prospect has just visited the website 3x in the last hour? Kick off a retargeting campaign, an outbound email from an SDR and fire up an account based marketing site. That kind of coordination across teams who may not collaborate on a day-to-day basis is going to unlock a huge amount of productivity and effectiveness, which was has always been the process of being data-driven.